The Domaine de Lagravière, famed since time immemorial for its excellent terroir and this famous « hillock » of gravel. In honour of the Count Hippolyte of Malartic, admiral who served the Kings of France and owner of the Domaine in the 18th century, the Château was renamed Malartic-Lagravière. Bought by Michèle and Alfred-Alexandre Bonnie at the end of 1996, the estate has been completely renovated. All the conditions have been united to make Malartic Lagravière’s wines worthy of their place amongst the greatest Bordeaux: a terroir and vineyard of high standards, innovative and high-performance qquipement devoted entirely to traditional winemaking methods, and a committed and passionate team. 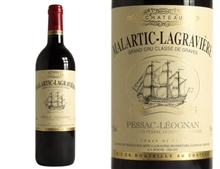 One of the only six classified growths both for its red and white, Château Malartic Lagravière’s wines are well known all over the world for their complexity, power, elegance and balance.